Ricardo launched its vehicle emission measurement service in April 2017. The system uses absorption spectroscopy to monitor and record emissions such as NOx and NO2 from a vehicle’s exhaust as it passes by a road-side sensor. It then matches these data to vehicle characteristics such as engine type and age. The system, which will be collecting live data on site at the AQE show, can measure emission from thousands of vehicles in a short space of time, without interfering with the vehicle being tested. This data promises to play an important role in providing cities and local authorities with the insight they need to develop Clean Air Zones and other air pollution mitigation measures. 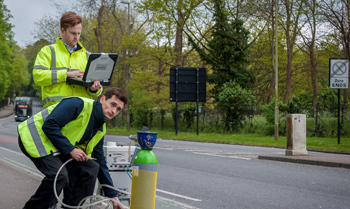 Ricardo has measured emissions from over 20,000 vehicles during its preliminary measurement phase, a volume that far outweighs what can be achieved with laboratory based or portable emissions measurement systems (PEMS) in the same space of time. Experts from Ricardo’s air quality team will be on hand throughout the AQE show to discuss the initial outcomes of this research and what it means for air pollution mitigation planning. Early results include a direct comparison between Euro 5 and Euro 6 engines under real-world driving conditions, and the impact that ‘cold-starts’ have on petrol and diesel engine emissions in urban environments.